The last time I played Standard with any seriousness was from the Time Spiral through Shadowmoor or Alara blocks. Back then, I fell in love with a mono-blue control deck, known to me by the name Sonic Boom. 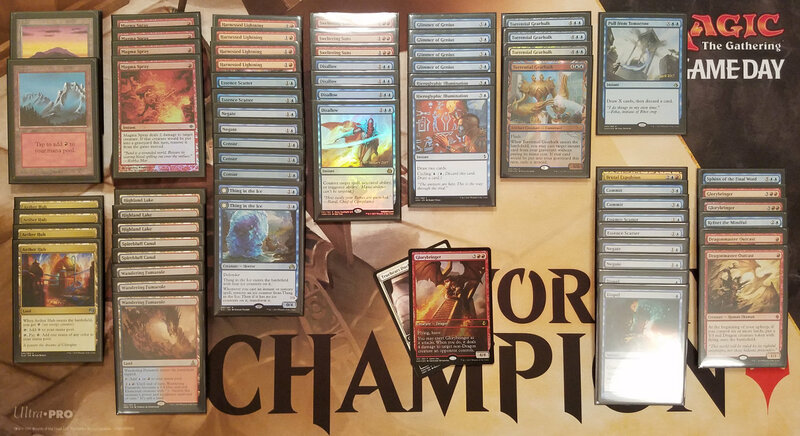 The list I ran at the time would have been nearly identical to this list that placed 7th at Grand Prix: Krakow in 2007, piloted by Guillaume Wafo-tapa. NOTE: I spend the next several paragraphs talking about my personal experiences getting into Standard with Sonic Boom, leaving the format, and returning. If you wish to skip to my Amonkhet Game Day experiences with U/R Control, scroll down to the Amonkhet Game Day U/R Control decklist below. I may have had to ask my friends what that name meant at the time, but nevertheless, I adored this deck. While I know decks like this existed before, the archetype was new to me at the time. And it made me feel powerful in a way Magic really hadn’t before. 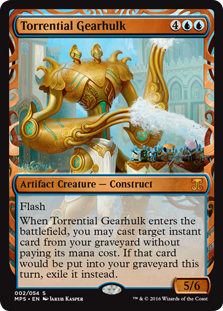 It took spells from two of my favorite blocks – Time Spiral and Lorwyn – that allowed you to drop a land and say, “Go.” You were then open and ready for whatever your opponent decided to play out. That kind of play is understandably frustrating to deal with, because it disrupts the patterns we typically expect in a game of Magic. It’s also understandable why WotC has tried to shy away from enabling draw-go strategies as of late. I get the reference now. Even if you did not play Standard during this time, you will likely recognize what makes this deck tick. You get to run Cryptic Command, Pact of Negation and Ancestral Vision. Yes, those cards were busted… er, powerful then, and they remain some of the best blue cards ever printed. Counter whatever your opponent plays, or spend your mana drawing cards if they pass without dropping a meaningful threat. And in the case of Cryptic Command, why not counter and draw? Once you’ve sufficiently exhausted your opponent’s resources, let a handful of creatures close the game. I most certainly was not the best pilot of this deck, but it lead me to winning a number of games at FNM, and it marked a transition for me. I started to think about Magic: the Gathering not only in terms of what I could put together to beat my friends at the kitchen table or during Highlander games in the cafeteria, but rather how I could learn to improve my skill in a competitive manner. I certainly failed a lot, but I started actually wanting to learn what I did wrong and what I could do better next time. What threats do I absolutely need to counter against Faeries, and what can I let resolve? 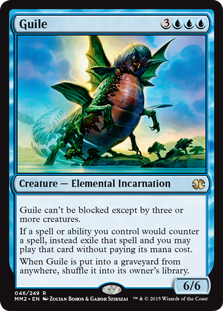 What opening hand can I keep against Merfolk? Which two modes on Cryptic Command are appropriate in the moment? In 2006, I started my undergraduate studies. Between Lorwyn and Alara, my time playing Standard dropped quickly. I made half-hearted attempts here and there, but after Alara block, I more or less gave up on the format. It wasn’t until my sophomore year that I met a group to play with regularly. We quickly became obsessed with EDH, and without cars, we did not often make it out of the dorm to play in public. After college, I found myself working multiple jobs, eventually ending up at a startup that drained a significant amount of my time. For a number of years, my experience with Magic was almost exclusively EDH and pre-releases. It was, of course, always one of my favorite hobbies, and a fine way to enjoy the game. But despite not always having the money or time to commit, I missed playing constructed formats. You will not be missed, my friend. Around the release of Kaladesh, I found myself at what feels now like a major turning point in my life. I realized that I had allowed work to take over my life entirely, usually working 50+ hours per week, constantly on call and taking essentially no off-duty vacations in several years. I really enjoyed my work and the people I worked with, but the stress had become unhealthy. I needed a change. With most of my play group either no longer living in town or no longer playing regularly, I forced myself into making time to visit the great LGS nearby. I used the release of Kaladesh as an opportunity to jump into prereleases and draft, two of my favorite formats. 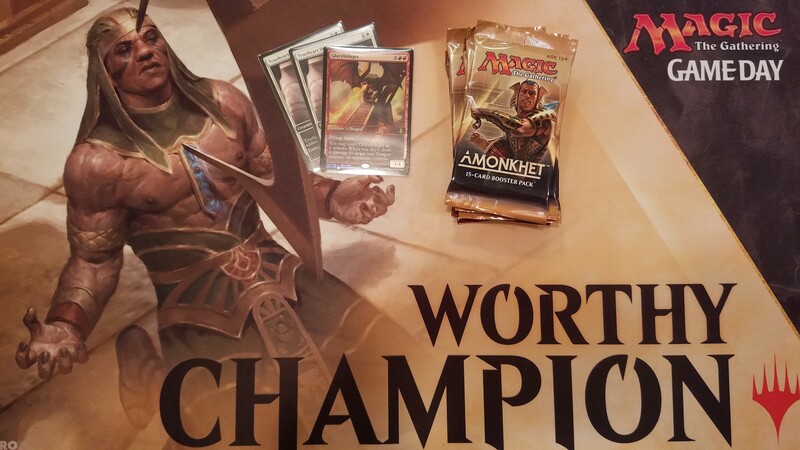 In late November, I made the difficult decision to leave my old job to focus on my health, and with newfound free time, I soon found myself playing Magic at my LGS most weeks (usually more than once, even). The reason this deck appealed to me is that it plays out a lot like Sonic Boom, and in some of ways, I think it does a better job of accomplishing those goals. Exhaust your opponent’s resources until mid-to-late game, and draw enough cards to answer anything your opponent topdecks. Once you stabilize, a handful of creatures seal the deal. While the tools in current U/R Control aren’t individually as absurd as Cryptic Command, et al., it does have a diverse set of answers. The addition of red means you can plan an even more reactive game, easing one of the weaknesses of pure control. While your opponent can try to bait you into using Essence Scatter on the lesser of two threats, full sets of Harnessed Lightning and Magma Spray let you choose what to remove at the end of their turn. Better yet, Sweltering Suns against many creature strategies will just wipe your opponent’s board. Above is the list that I brought to Amonkhet Game Day this weekend, and it ended up undefeated. It’s very similar to lists you’ll find on MTGGoldfish and ChannelFireball, but with small adjustments meant to deal with a creature-heavy meta (as well as what I was able to acquire in time for the event). 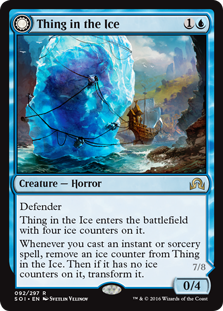 The primary difference from the well-known lists is the cut of Void Shatters and fewer copies of Hieroglyphic Illumination in favor of mainboarding two copies of Thing in the Ice and an additional Sweltering Suns. The deck should also be running a full set of Spirebluff Canal and Wandering Fumarole instead of the Highland Lakes, but I played what I had available. There were a few instances where a Canal’s faster mana would have been advantageous, but I did not end up having many mana issues. The sideboard differs a bit as well. Specifically, I ran two Glorybringers as additional threats, and both Kefnet the Mindful and Sphinx of the Final Word against control. The primary weakness may be hard removal for the Aetherworks Marvel matchup, but boarding in more counter magic may help. In action, the deck performed very well on Game Day, with zero game losses. Most games played out about as well as they could: remove or counter until opponent runs out of gas. Perhaps the biggest challenge was finding the right time to run out Sweltering Suns. It feels good to use your resources wisely and eliminate multiple creatures, but it’s easy to get too greedy. While the deck did go undefeated, I think it’s important to mention that low turnout meant there were fewer rounds than planned. This also meant that I did not get a chance to face off against Marvel or B/G Energy, both of which may have been more challenging matchups than I saw at my LGS. I did, however, face off against Mono-Black Zombies and Naya Humans with Heart of Kiran. Both decks ran out of gas and had difficulty dealing with Awoken Horror. Surprisingly, my toughest match was against G/W Cat Tribal. The deck ran mostly common cats, including a set of Graceful Cat from the Planeswalker decks and a set of Wily Bandar. You may not take it seriously, but my opponent did a good job of dropping their entire hand early, then pumping with Oath of Ajani and Regal Caracal. 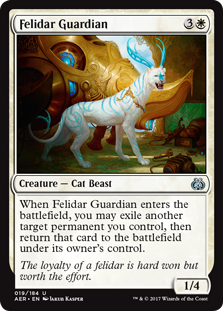 Throw in Felidar Sovereign for a chance to win off lifelink, and the deck was actually quite effective. In the end, though, it just could not recover from Sweltering Suns. This deck is a lot of fun to play. With the aggression present in the current Standard format, every game feels like a real fight. Even if it’s not necessarily the literal best deck available, it’s made me excited to play more and become a better pilot. While it was still disappointing to not face off against the most powerful deck in the format, Game Day was a great experience. I look forward to running it again next week at Nexus Game Fair in Milwaukee.